Panasonic's Toughpad FZ-G1 is an expensive 10.1in rugged tablet, but it's impressive. It runs fast, it has a good array of features and options, and it has a removable battery and relatively good field serviceability. All this in addition to being dustproof, water resistant, and capable of surviving 1.2m drops. If you've ever seen the inside of a police car, you may have noticed a thick-looking notebook or tablet device mounted near the central console (don't go getting yourself arrested if you haven't). Most of the time, that device is a Panasonic Tough product of some persuasion, and the police force uses them for a reason: they are built to withstand rugged conditions. Panasonic's Toughpad FZ-G1 is one such device, and while it may be a little too small for a squad car or highway patrol vehicle (a bigger screen would be easier to work with), it's nevertheless designed for environments in which a toughened mobile computer is required. We'll point out right now that the Toughpad FZ-G1 isn't a consumer device, even though Panasonic recently updated it to run Windows 8.1. It shouldn't be thought of as something that will be used at home or in an office simply to browse the Web or post status updates to your favourite social network. It's a tool that's aimed at professionals who need a field-ready tablet to run Windows applications. It can be used for data entry, viewing video, and any other task you can think of that can be done with a tablet in hand. The scenarios in which the Toughpad FZ-G1 can be used are numerous, but the most obvious environments in which it's suited are hospitals, warehouses, and factory floors where a fast computer for displaying, logging, and accessing information is required. It's also well suited to outdoor activities, be they in the bush or on the beach. Basically, anything other than an office environment (though you can use it there, too, if you have a dock for it). Carrying a device for long periods of time, especially a rugged one, can be tiring, so Panasonic has tried to make the the FZ-G1 as light as possible without sacrificing the product's strength. This means that accidental drops from a typical carrying height won't cause it harm. It has a screen size of 10.1in, a thickness of 24mm, and it weighs 1043g. As a comparison, the 10.6in Microsoft Surface Pro 2 weighs 914g and is 13mm thick, so the Toughpad isn't outrageously heavy, just a little more bulky. The reason for the Toughpad's extra weight and bulk is a chassis that has been reinforced to protect the screen and the components within. The screen has a better-than-Full HD resolution of 1920x1200 that should be useful for displaying diagrams and schematics (among other high detail content) in the field, and it's based on IPS technology, which means it can be viewed quite easily from the sides if you're holding the tablet in a portrait orientation. It's a capacitive touchscreen that's sensitive to gentle touches (you don't need to press down hard on the screen to interact with it), and it has the usual sensors for automatically detecting orientation and light levels. The front of the screen has a layer that protects the screen from heavy pokes, but it's not scratch resistant. The touch performance of the screen was responsive and mostly accurate during our test period; our fingers also slid across the screen easily. Because it's not a highly glossy screen, fingerprints weren't really noticeable and reflections weren't a problem (the high brightness helped with this, too). We can compare the performance of the screen to that of a typical consumer-grade tablet, but the top layer does, at times, become too visible and you can see a grainy pattern. Because the 1920x1200-pixel resolution is housed in just 10.1in worth of real estate, text is very small, and icons and other objects on the Desktop can be very difficult to hit with good accuracy. For this reason, Panasonic ships the tablet with the text size set to the 'Larger' setting in Windows 8.1's display properties, which makes things just big enough so you can use your finger to navigate. If you want to use the 'Smaller' setting so that you can make the most of the high resolution, then you can use the attached digitiser pen to tap things and navigate around the screen. It's a pen that lives in a compartment on the left side of the tablet. It's held by a cable that's of the coiled-spring variety, and it can be stretched quite a bit so that you can use it on the right side, too. It does take a bit of manoeuvring to get comfortable with it, though. It also might take some calibrating before it hits its targets accurately, especially towards the edges and corners of the screen. In addition to being a navigational aid, the pen can be used with ease for handwriting input. It works well with the built-in handwriting features of Windows 8.1, and we think it's an effective way of taking down notes in applications that support handwriting recognition. There are shortcut buttons located along the bottom of the screen, and they are sealed so that dust and water can't get to them. There are two shortcut buttons that can be used to bring up the Panasonic Dashboard software and the Windows 8.1 on-screen keyboard, respectively, and there are also volume, screen lock, and Windows Start screen buttons. The power button is located to the right of these buttons and next to the status lights for battery, hard drive, and power. It's not as easy to press as the other buttons, which means you can't inadvertently power off the system with an errant tap of the power button. The body of the tablet is made from magnesium alloy, and it's topped with what feels like a hard, almost rubber-like material along its top edges and at the corners. Basically, it's a huge bumper for the Toughpad's gizzards, which include an Intel Core i5-3437U processor and a vPro chipset, 4GB of RAM, and a 128GB solid state drive (SSD). It helps them withstand drops from up to 1.2m onto hard surfaces. During general usage, the tablet was quick and responsive. Part of this is due to the fast SSD, which recorded a read rate of 493.1 megabytes per second (MBps) in CrystalDiskMark, but, more importantly, a very fast write rate of 445.6MBps. In our Blender 3D rendering test, the CPU logged a time of 43sec, which is a good one for a tablet with an ultra-low voltage processor. While the tablet was being used, we noticed that the fan kicked in regularly, even when we weren't using it for intensive tasks. It became very loud when the processor did have to perform hard work, and while it was a annoying for us in an otherwise quiet setting, we don't think it will be an issue while being used out in the field. The fan draws fresh air from the vent on the rear of the tablet, and kicks it out through the heat sink that's located on the top-left edge. There are panels you can open with a Phillips-head screwdriver so that you can clean any accumulated dust or grime from the heat sink's fins. Standard Phillips-head screws hold a lot of the tablet together, making it relatively easy to service the product while in the field. 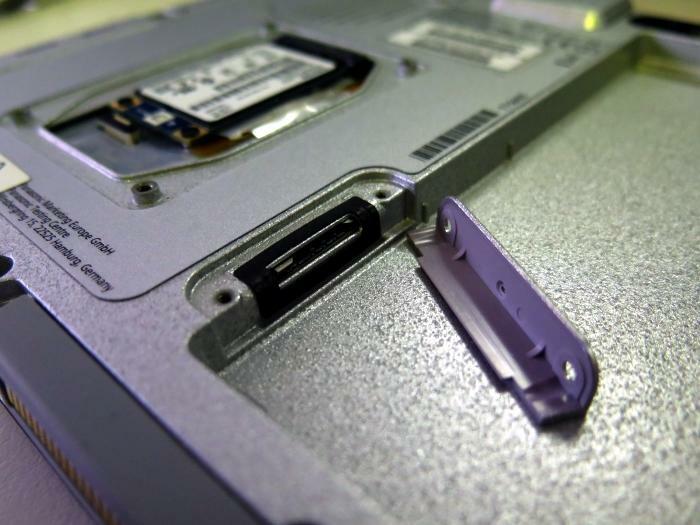 Primarily, you can easily access the SSD by removing the bottom panel. The battery is also removable, which means spare batteries can give you as much life as you require away from a mains power source. In our battery rundown test, in which we disable power management, enable Wi-Fi, maximise screen brightness, and loop an Xvid-encoded video file, the tablet lasted 3hr 47min, which is an expected time for a third generation Intel Core i5 CPU. There are ports located along the sides, but you won't see them if you take a quick glance. They are hidden behind flaps. These flaps can be difficult to open, and that's by design. They contain seals that contribute to making the FZ-G1 impervious to dust, and they are also part of the reason the tablet can withstand water that's projected onto it (but it can't be immersed in water). The battery connector has a foam seal around it to keep dust and water from reaching it. The ports on the right side include USB 3.0, full-sized HDMI, and a headset jack. 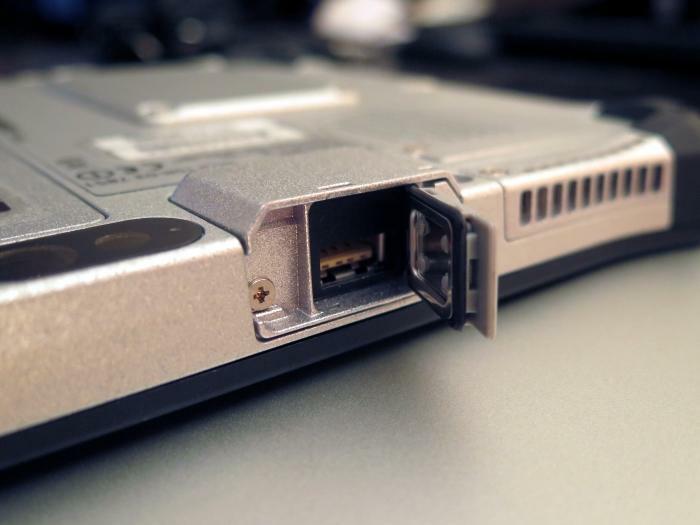 The USB 2.0 port at the top of the tablet. You can also see the air vent on the right. 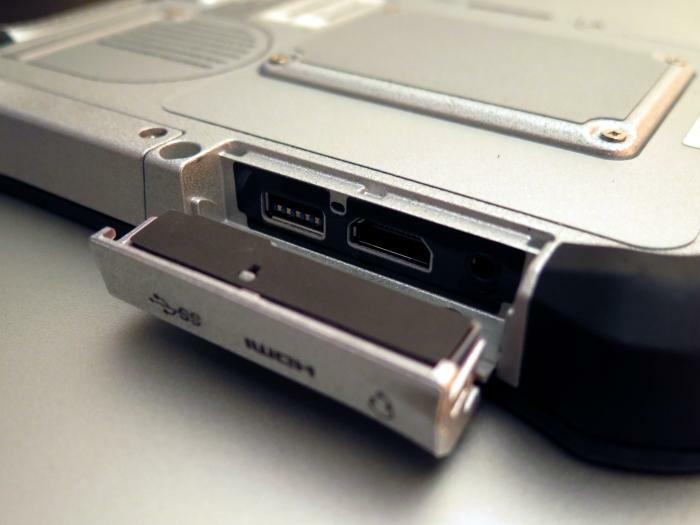 A single USB 2.0 port is located on the top edge of the tablet, and there is a USB 3.0 port on the right side. This sits in a bay with a couple of other connections: a full-sized HDMI port, and a headset port. 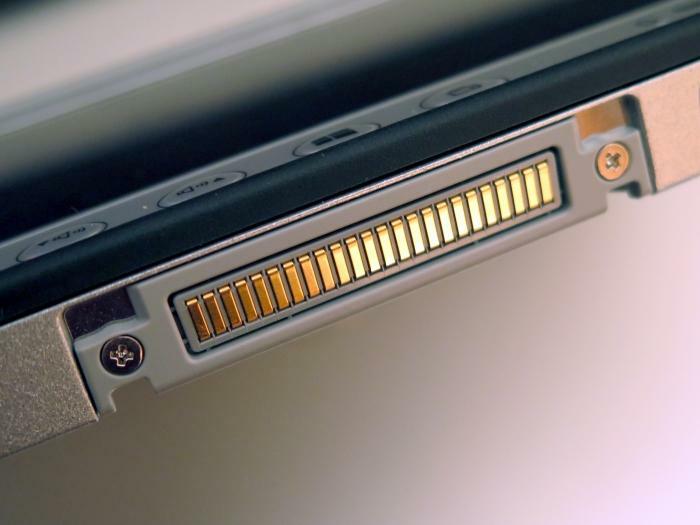 There are front and rear cameras, as well as a LED flash for the rear camera. Two external Wi-Fi antenna connections are also present. A dual-band 802.11n Wi-Fi module is installed (Intel Centrino Advanced-N 6235), and you also get Bluetooth. 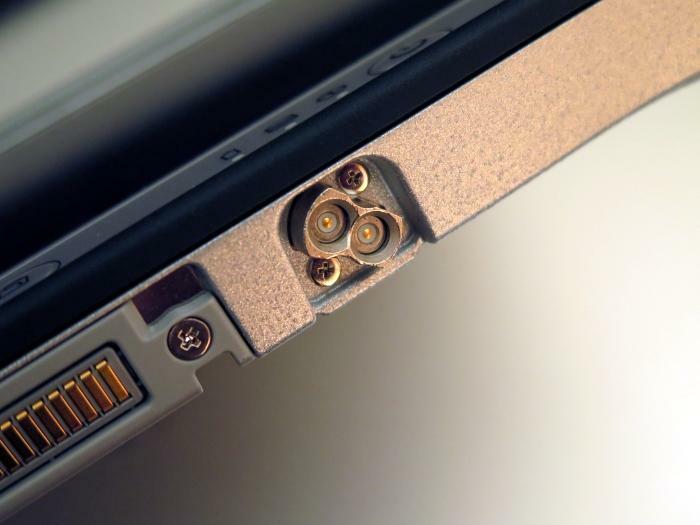 There's a docking connector at the bottom of the tablet for when it's to be used on a desk or in a vehicle. 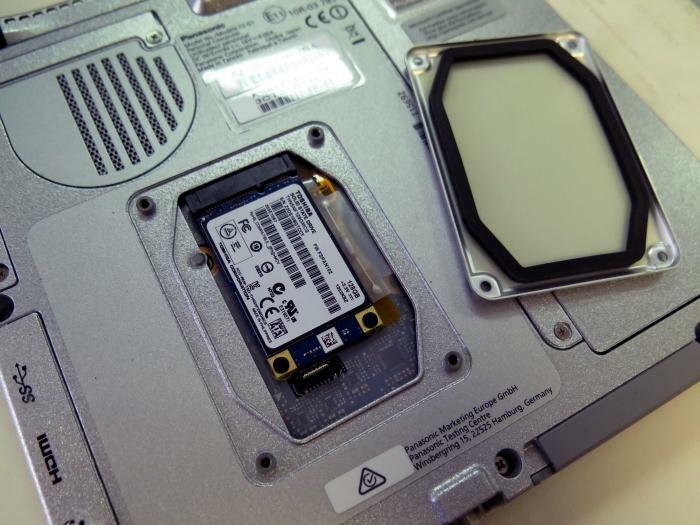 Mobile broadband access is an option, and the SIM card slot for taking advantage of this is located adjacent to the battery compartment. Like the other ports and slots, this one is sealed, too, and its panel is held by a couple of screws. The thing about the Toughpad FZ-G1 that's hard to overlook is the price. It can cost well over $3000 depending on the options that you choose (the starting price was $3299 when it first launched in April). You'll have to analyse your business needs carefully before buying it to make sure that you actually want all the security features and options that the Toughpad can provide in a rugged setting. (Security features include TPM 1.2 and the option for a smart card). It might be a case where your business can get away with using a consumer-grade tablet for a third of the price for the same tasks — if you don't think you'll get more than one breakdown or damaged product per year, simply replacing broken tablet could be an option. But that also raises questions of productivity as far as work continuity and IT support are concerned, as well as waiting times for replacements. We'll just say that if you need a fast and highly capable Windows tablet for use in an environment in which drops, significant water splashes, and dust particles are a high risk, then the Toughpad FZ-G1 should be seriously considered.